On October 4, 1951, a futuristic two level indoor/outdoor shopping center often described as New England's first mall opened on Rte 9 to the east of Ken's Steak House and south of Route 30.The domed roof of the Jordan Marsh store on the Rt. 9 end of the mall looked like a flying saucer, spanning 227 feet, and 54 ft high. It was considered the largest unsupported dome in the country at the time, and served as a landmark to this section of Route 9, often called the "Golden Mile". The Jordan Marsh store anchored the mall at one end, and a Cinema the other end. 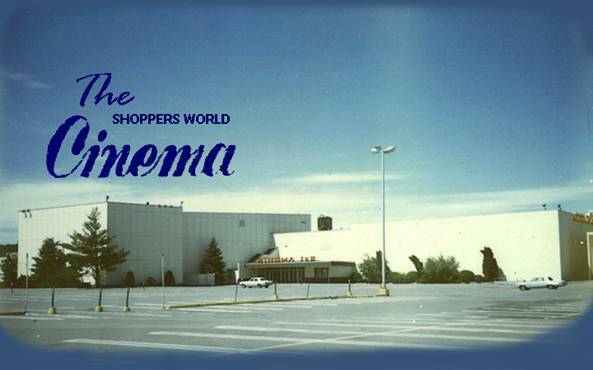 General Cinema, the pioneer in shopping center theaters, opened the first Cinema at Shoppers' World . Allied Stores theorized that a theatre was an important way to draw shoppers at night. How successful a theatre in a mall would be, was a question, so for the first two summers, movies were suspended, in favor of a proven national success, summer stock. The Cinema became the County Playhouse and provided area residents with an opportunity to see Broadway musicals, comedies and dramas starring some of the motion picture and television's biggest stars. Among the roster of entertainers, coming here even before the days of the Carousel Theater and the Monticello Restaurant, which were later to become showcases for celebrities appearing in New England, were Mae West, Marlon Brando (who mentions his summer tour here in his autobiography), Enzio Pinza, Claude Rains, Melvin Douglas, Alexis Smith (big star of "Follies'"), Billie Burke, Dana Andrews, and many more. Television's Mr. Peepers, the late Wally Cox, drew the biggest crowds of the entire summer stock season in the United States, the week that he starred in "Three Men On A Horse" at the Country Playhouse. The straw hat circuit proposed by cartoonists Lee Falk and Al Capp, though well received here during the two-year run, was unable to continue once the new screen was added. From this point, the Cinema operated year-round as a motion picture theater, adding a second theatre in 1963, two more in 1974, and then splitting the two largest screens to become a six-plex. Special attractions held at Shopper's World included the Lone Ranger, Hopalong Cassidy, Rin Tin Tin and Rusty, circus acts, clowns, puppet shows, band concerts, actors like Crazy Guggenheim, Major Mudd, and the annual appearances by Santa and his Reindeer. There was a small area of kiddie rides at the northern end. The entire structure was demolished in December of 1994, and turned into what was called a "power center", with large warehouse type stores surrounding a parking lot. So ended the age of the Golden Mile in Framingham, and even with the opening of the megaplex a short distance away, the history of "The Cinema" was over. Click on the links below for pictures the way it was.